The shooter was identified as 28-year-old Ian David Long, a former Marine who was deployed in Afghanistan. The bar hosts a "college country night" every Wednesday for people 18 and older, according to its website. 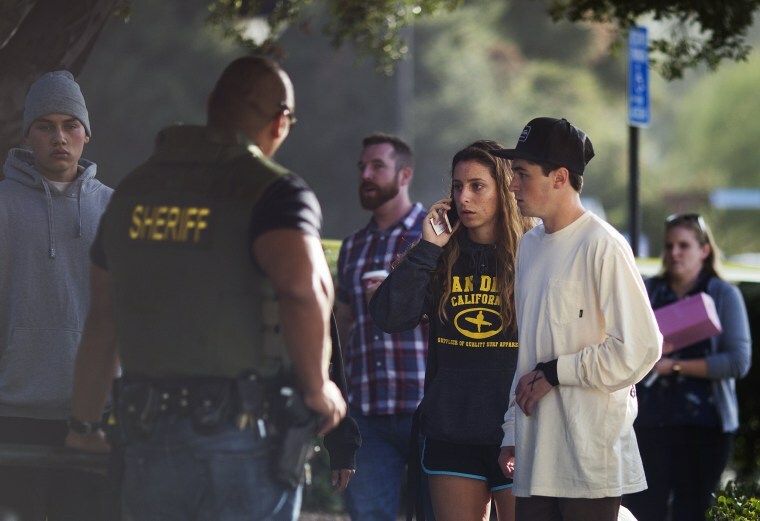 Pepperdine University in Malibu tweeted that several of its students were at the bar at the time of the shooting, but could not confirm if they were among those killed or injured. Sergeant Eric Buschow, with the Ventura County Sheriff's Office, said on MSNBC that Long also served in the reserves. Long was found dead inside Borderline Bar and Grill from a gunshot wound, authorities said. Dean said it's believed it self-inflicted, but it's still being investigated. In April, deputies were called to his home in April by family members who were concerned about the "behavior that he exhibited," Buschow said. Dean said during the news conference that Long was acting erratically and a crisis intervention team was called. Authorities eventually cleared Long and determined that a psychiatric hold was not necessary. "We do not know at this time how many rounds were actually in the weapon or how many rounds the magazine could actually hold because it's still being processed as part of the evidence," Dean said. The sheriff's department is still working to identify those killed in the shooting. Several hundred people were inside the venue when gunfire erupted. Dean described the incident as a "tragic, tragic situation." “Ron was a great guy," Dean said during Thursday's news conference. "Hearts are broken all over." Cal Lutheran alumni Justin Meek, 23, also died, school officials confirmed. The school said Meek, who graduated in May, "heroically saved lives in the incident." Students at the school said witnesses at the bar told them that Meek jumped in front of his sister and others to shield them from Long. Also killed in the shooting was Pepperdine student Alaina Housley, the niece of former Fox News correspondent Adam Housley and his wife, actress Tamera Mowry-Housley. "Our hearts are broken. We just learned that our niece Alaina was one of the victims of last night’s shooting at Borderline bar in Thousand Oaks," the couple said in a joint statement Thursday. "Alaina was an incredible young woman with so much life ahead of her and we are devastated that her life was cut short in this manner." To escape the gunfire, officials said bar-goers hid in bathrooms and in the venue's attic. Witnesses told authorities that some people used bar stools and chairs to smash the windows so they could flee. Authorities have said at least 10 people were injured.